The experimentation on the Digital Social Currency Pilots in D-CENT can be conceived as an open-source approach to decentralized complementary currency design, which becomes ever more relevant where pilot communities are already actively designing tools for collective engagement and decision making on monetary economic matters affecting their communities. D-CENT is going to prototype the Freecoin Toolchain as a set of features that are apt to advance the state-of-the-art in two domains of social innovation: complementary currencies governance systems and decentralized trust management systems. The basic tenet to consider is social currency as reputation management that can inform the money supply of a complementary currency in terms of tolerance to credit risk. Secondly, since both trust – or a ‘promise to pay’/IOU – and codebases are virtual, running trust management on a Blockchain is remarkably worth a try. Finally, trust management can be seen as a symbol-based automation of social decisions related to trust, where social agents instruct their technical representations how to act while meeting technical representations of other agents. 1. Iceland: a blockchain enabled municipal currency inspired by the case studies from Libra Circuit or the SoNantes (France), and coupled with use-cases like the HullCoin (United Kingdom). Iceland is offering the best suitable social environment for a Lean UX development of the currency software toolkit in D-CENT. We aim to facilitate the usage of cryptographic blockchain technologies by co-designing Social Kronas, a reward system for political participation integrated in Betri Reykjavik in collaboration with the Municipality of Reykjavik. 2. Spain: the Eurocat complementary currency has already been launched in Barcelona on April 2014. We conducted an in-depth research on the status of the project, acknowledging that Eurocat needs a digital decentralization strategy to secure its resiliency and the reliability of its digital commons. We intend to envision and facilitate the evolution of its existing technical architecture to foster stewardship of shared data among participants. The aim is to decentralise the storage and distribute the responsibility of service hosting and data custody. 3. Finland and Italy (Milan): a decentralised social remuneration system that can reward the contributions that members of Helsinki Urban-Cooperative Farm perform to the common interest of the cooperative, i.e. Multapakku. This model will be also piloted in Milan, at Macao, an HUB for cultural workers of the city. The common characteristic of the different pilots is the need to strengthen the democratic debate necessary to consolidate and preserve the management of economic transactions, especially those with a social orientation and impact, inside the local monetary circuit. Indeed, it is only through a democratic and participatory deliberation system that citizens can collectively define bottom-up their social needs, also in terms of monetary needs, and inform the choices made not only on resource allocation, but also about investment in social objectives and ethical criteria, i.e. digital social currency experiments to foster direct democracy across Europe. We experiment in a scenario whereby human decisions deeply influence the behavior of algorithms and not the opposite. Contrary to what happens in most crypto-currency design approaches, which tend to privilege the role of software and marginalize human contribution to a mere servomechanism – see the ‘machinic economy’ manageable only by an elite of engineers or the myopic limitation of the money supply to fixed numbers of coins that creates structural inequality and entry barriers in a white male dominated environment – the Freecoin Toolchain puts humans back at the centre of the currency creation stage, without color, gender or social status distinctions. How? The literature review on the blockchain technology, its bio-political critique and promising implementations for the social good, make emerge a new way to look at the relation between the participatory democratic process and the blockchain technology in the context of the governance of complementary currency systems. Within the scope of the D-CENT project, the Digital Social Currency pilots will experiment and test a new notion of proof-of-work: the Social Proof-of-Work, which is roughly the proof that a member in the system is endowed with coins as a reward to an action in the real world while abiding to community rules and enhancing collective values. 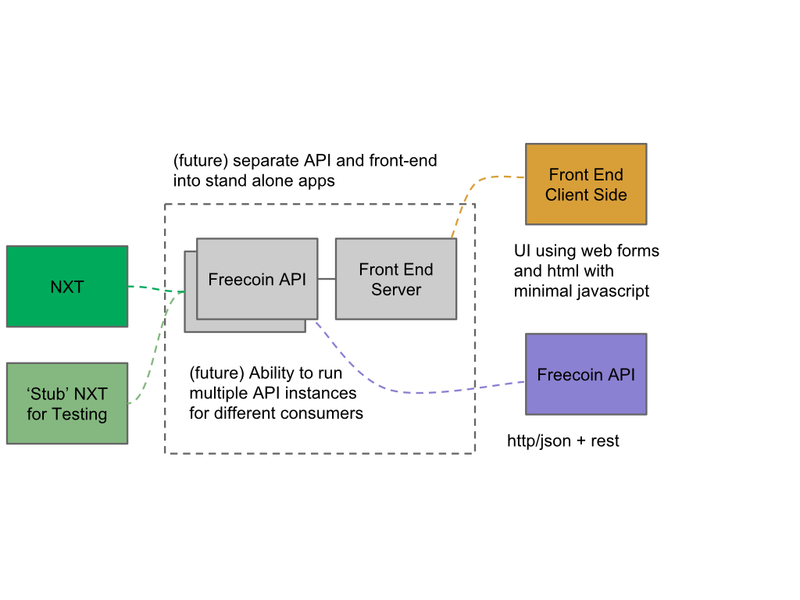 Beyond inflation and deflation, the Freecoin Toolchain is an experiment in decentralized digital currency design that aims to contribute to the development of a self-adjusting money supply by harnessing the inputs of users of a currency system. By linking democratic deliberation with currency creation through the Social Proof-of-Work, systems can be designed to enable a flexible currency supply set in real time at the light of users trust management dynamics. Exploitation of the Freecoin tools and features ranges from use-cases that may run in parallel with new governmental innovations for the recovery of national economies such as Greece (FutureTax-Coin) or the trust management dynamics shaping the governance structure of the financial services industry at the aggregate level. From a technical design point of view, we believe that even beyond the span of this research and its application to pilots it can be of great interest, both for business and social potential, to develop and document a Freecoin Toolchain software kit based on Bitcoin Core 0.10 and capable of bootstrapping the genesis of new ad-hoc blockchains, integrating the work done in the e-democracy D-CENT pilots and the Social Proof-of-Work concept, therefore implementing a more desirable – read democratic – mode of operation of the blockchain, also environmentally sustainable.